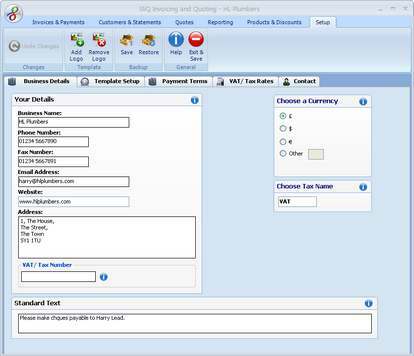 Customising your Invoice TemplateSliQ Invoicing provides easy options to let you enter your business details and customise the look of your invoices and quotes. Choose a template style to suit your business ! Add your logo, customise the template text ! This screen allows you to enter details of your business: its name, address and so on for use on your invoices, quotes, credit notes and statements. You can also enter standard text such as your company number, payment details, e.g. BACS number and any other information you want to be included on all your items. 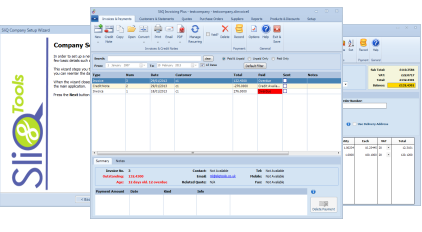 With SliQ Invoicing Plus, you can also edit the templates supplied with SliQ to add any extra text you need.